Inspiring the Next Generation of artists at the CTN Teens Week! 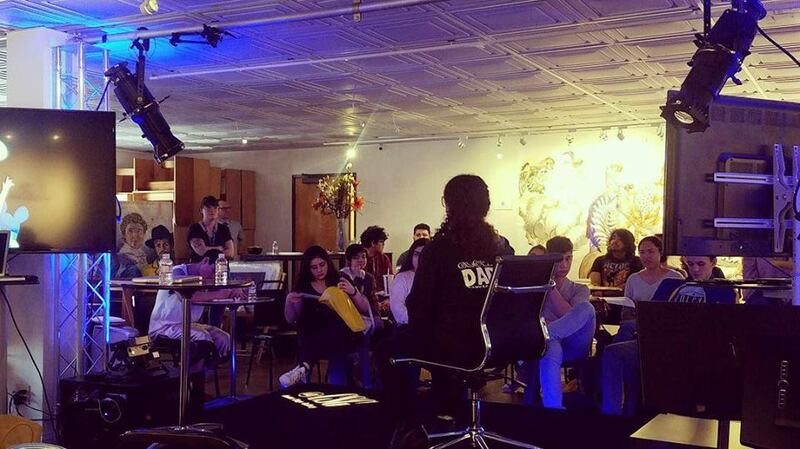 Very happy to be able to attend to this super cool CTN Teens event organized at the CSG Gallery in Burbank as a part of inspiring and promoting Art as a Career for the next generation of Artists. We were part of a set of Lectures along with other artists where we shared our experiences and answered Q&A from teenagers attending to a variety of the Burbank High Schools. Can’t wait to see what they can do! CTN Roadtrip Coming Up! 29-30 April, Burbank! One more year for us at the CTN Roadtrip !!!! That is one of our favorite events of the year! Not only we see again some awesome fellow artists and returning familiar faces but also we can share our new products with everybody that walks by and wants to have some original goodies from Glow in the Dark. CTN Road Trip is the perfect Entertainment Craft Fair where you will find an opportunity to sell and find original art work with some animation influences as well as unique customized merchandising. The show will go on Saturday 29- Sunday 30 of April 2017, in Down Town Burbank. We will be at booth C19! - Little Ones Greeting Cards: featuring a special one for Mother's Day. - Little Ones Tote bags: Little Helper, Adventures Ahead and our convention special one, Ready for Summer! - Little Ones cute stickers! - Our "Wish list" notepad, and "Spells" Post-it notes. - Some fun and awesome "Pirates Tattoos". Also keep an eye on our booth!! We might have some sales and fun stuff for the ocasion! We hope see you there!!! !